These are literacy centers for the entire month! They are easy to print and set up, and cover reading, writing, spelling, vocabulary, grammar, and technology.113 pages included, with 64 centers. 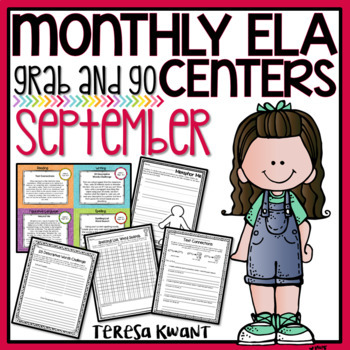 These centers provide an entire month of literacy work for September (or whenever your Back to School month begins)! These are literacy centers for the entire month! They are easy to print and set up, and cover reading, writing, spelling, vocabulary, grammar, and technology. 113 pages included, with 64 centers. Each center comes with a task card and a corresponding worksheet (with the exception of the “teacher directed center”. I leave that task card blank, because as the classroom teacher, you will know what to teach your small groups best. The technology center sometimes does not require a worksheet as well). Technology (these are optional centers depending on the available technology in your classroom. Most centers require at least an iPod or a computer). There are 64 tasks cards, corresponding worksheets for each center, 8 pocket chart center cards, pocket chart cards labeling classroom groups, and card labels to place around the room saying where each center is located. *Some Reading centers will require the classroom teacher to provide reading material, other than that, print, copy, laminate, and you are ready to go with Language Arts Centers for the WHOLE month of September! great resource-I will be purchasing more! I now have September, October, November, December, January…before I knew there was a bundle…That’s ok, I only need February, March, and April to complete my set. using these next week for the first time!! I have a Gr 4-6 split class, and it’s hard to find ELA resources that are appropriate for all grades. This will be wonderful! If it works well, I will buy the whole year’s worth of centers. Thanks! Good resource, though depending on your students it may require some pre-teaching before they can independently do these tasks. Great resource for getting our students’ feet wet. I love this resource! Will definitely be back to buy more, should have just done that in the first place! Creative and fun for the student centers. Such a find!! New grade level this year and I am THRILLED to have many of reading centers ready to go! Thank you! I love your products! Couldn’t resist this one! I can’t wait to use these this year! Thank you! Just what I needed to get started with centers. I can’t wait to use these! Thank you! So excited to use. Love this. Thanks so much for all the work you put into this. This is a great resource! It is a huge time saver and my students loved it. Thank you! thank you this is exactly what I was looking for. I know I will be buying monthly! Excited about this resource. Engaging activities for centers. Love the variety. Great for station work….kids enjoyed it! Look forward to using it every year! Love that there are so many options for the students. Great product excite to use! I wish the technology station was a little more interesting but other than that, can’t wait to try this out. Super excited to explore and implement this resource! Used these all year with my students. A great resource to use for small group work and during RTI time. Thanks! LOVE. I can’t wait to use it! Great way to get started at the crazy beginning of the year! Easy to use! Kids love them! I love these centers! They are so thorough and well planned! These are great for ideas for my centers. Excited to use them! I love that these centers are ready for me to use! I use this packet to help me run my centers. Great packet! Once the students got a hang of the routines, they enjoyed doing the activities. Can’t wait to use these in my classroom!! Great product. Can’t wait to use it in my classroom. Great product and a resource. I used this product for centers and it worked well. So easy to use! Thank you! This is a great resource to have for centers. One of my favorite products to use! The students stay engaged and they love doing center work! I teach a 3/4 split classroom. I use these with both of my classes and the students really love the sense of importance they derive from working independently (mostly). Thank you for this wonderful resource! I loved this!!! Thank you! New to centers/Daily 5. What a help this was! No longer are reading stations my least favorite thing to plan! My students and I love these centers. Awesome resource! I love it! This was a huge help in getting us started at the beginning of the year. Thank you. I LOVE these centers! Great resource. These are amazing! After prepping, they are so easy to use! Love these! Great to use in my 3rd grade special education classroom! Awesome resource! I can’t wait to start these centers with my students! Thanks! Reading centers were totally out of my comfort zone. You made them manageable. Thank you! Great resources for reading centers. Thanks! So awesome and very well put together!! Everything is done for you!!! Very easy to use and set up. Thank you! Excited to use this this year! This resource was a great help getting my year started and the kids are loving it so far! I love using these stations. It is easy for me to add in or take something out if needed. I can add a different text but still have them work on the same skill. Thank You! Love this product, very detailed. Great activities for my workshop time! Love the variety of activities available in this resource! Looking forward to trying these out with my class this year. I used this with my 3rd graders last year and with my 4th grade class this year. Thanks. Thanks! I run my centres a little differently but now I have some excellent tasks to pull out when I get stuck! Thanks! Great resource. I have every month! Lots of great Reading activities. I have a small group this year, so one we will have lots of great options. Love the task cards! I am loving these and will definitely be purchasing other sets! I am looking forward to using this resource with my students! Thank you! This is a life saver! Thank you for creating it! These look so wonderful! Can’t wait to use them this year! I really, really adore these centers. They are super comprehensive! However, I would warn teachers on the younger side of this grade spectrum that a lot of these centers aren’t “pick up and go” at the beginning of the year and would require students to get a bit of introduction before doing them! I’m adding station rotations to my classes this year. This is a great product to help me figure out what will work with my kids. Very thorough! Complete and ready to use! Thank you for sharing this wonderful resource!! I cannot wait to add this to my daily schedule!! LOVE LOVE LOVE! I came across these last year and they have saved me so much time! I love them, my kids love them. It’s a win win! Thank you so much. This’ll be my first year teaching fourth grade ELA only, and this will be a life saver! Excited to use these this year! Getting ready to prep these for September. Great quality. I am very excited to use these for the beginning of the school year. Can’t wait to get them printed and laminated! very excited to use this as a differentiation resource! I am so excited to use these next year! This is exactly what I need for my reading block! The best part about this is being able to use any text with the reading center. Hoping to get much use out of these in the upcoming year. Great ideas for use in centers. Great center activities and so easy, did I say easy, to use. Thank you. Great resource that students love and is easy to implement!! My students have enjoyed the May version of this so much, I decided to get this one to roll out at the beginning of the year next year. Well organized and lots of activities. The kids love these activities! These are amazing! Such a wonderful resource for the classroom! So many great ideas to use for the entire year! Thank you for making literacy centers an easier task. Your hard work is greatly appreciated. So many good things here! Love it! These were perfect for my reading centers and so easy to set up. These were good for getting back into the routine. This was ALOT of information and worksheets! It was a little overwhelming at all the papers! HAHA But trust me this was well worth the money. Many pages to use and grab and go! Very well organized. My kids love them. These are great for daily five! These centers are fantastic! Easy to print and I can’t wait to get more. Great resource. Took two weeks to set up and was lots of organizing (I did all at once) but the handouts are perfect and reinforce all that I’ve taught since the beginning of the year. Love the monthly approach . . . keeps me from getting ahead of myself or overwhelmed! These monthly centers are amazing! Thank you!! Wow! Thank you for your work! Great resource! This was just what I was looking for. Thanks so much! Thank you! This was an awesome product that both myself and my students loved! Can’t wait to get the next one! I really love all of the Grab n Go centers. I like to pick and choose what I’m going to have my students do. I even pull some of the activities as quick and easy activities to leave for a guest teacher. I’m excited to use these! Just what I needed to get my students engaged during center time. They really liked the activities. I love this packet! My students do the activities daily while I work with small groups. I just bought the October packet, which I can’t wait to dig into. I just wish I could afford the full-year packet; I just haven’t fully recovered from all summer without pay. As a new 3rd grade teacher, this helped me a lot during my guided reading time. Great activities with minimal prep time. Thank you for this! I am prepping yo ise these starting next week! Loved the whole month bundle! Students enjoy the centers! Love these!! It takes a lot of the pressure off when I have to think about centers. Thank you! love this! probably going to buy the remaining months as well! thank you! I am excited to use these in my class! Thank you!!! I love the noun, verb and adjective sort!!!! I’m so excited to use this! It looks amazing. Getting ready to use this during Lit stations! love how everything is already set up ready to go! I love I can use my own things as well! THANKS!! Love the resource! I had to purchase the entire bundle! Super!!! Love… Ready to use!!! I plan to start using this right away. Thanks for such a great resource! These are perfect! Can’t wait to get these centers started with my kiddos! Perfect for getting my students into the flow of center rotations. Also a great way to check their ability to work independently and figure out what they already know. I am VERY excited to use this in class! Thank you so much for all of your hard work. My students will benefit greatly from it! I love, love, love this!! I teach second and third reading and I really wish you had one for second grade too!!!! This is a great resource for my classroom! Love how organized this is! Use it all of the time! Awesome product…Easy to have centers in the classroom now.. Thank you!!! Excited to use! I always have good intentions of starting centers in my class. This will help with great ideas for my students. Looking forward to using this!! Can’t wait to use! Thank you! Thank you! Looking forward to using with my self-contained 3-5 ED class. Can’t wait to use these at the start of school!!! These look great! I can’t wait to use these with my 4th graders this year!! I am so eager to begin using these in my classroom. It is a well-planned file and clearly a lot of time and effort has been put into organizing it. I like the flexibility that is provided and all the resources that are included to use, or not, as the teacher sees fit for each classroom. THANK YOU!!! Really looking forward to seeing how this resource works in my classroom! I’ve never done centers before (high school English teacher for many years), so I’m very thankful that you’ve detailed everything out! 🙂 Thank you so much! These will make my language arts block much more manageable. I cannot wait to get started!! Great product! Looking forward to implementing these into my 4th grade reading block! September will be so easy now! Great resource! Easy to use! My students enjoyed the different activities. These centers look great and worthwhile for my students. I can’t wait to use them next year! The activities are fun and interesting. Love everything about these centers! I teach 5th and they are great! I love it! Thanks for you hard work! These are amazing centers! Thank you! Love this! I eventually want to get the bundle, just couldn’t right now. Thank you! So well organized and well thought out. Such a time saver! I am so excited to try these and buy the bundle. I could buy your whole store! Thank you! Wonderful product! Can’t wait to use! These were great. Kids loved them. Looking forward to using these to help get center routines off to a strong start for next year. This is probably the best purchase Ive ever made on here! The organization is taken care of and the centers use the kids spelling words, which is great since I have 4 lists for different levels in my class. Thanks for the hard work and well worth it! Tons of good ideas and activities, thank you! I love these ideas! I own them all now and they have been wonderful. I used these in workstations. Very useful. Very helpful for implementing centers as a first year teacher! Thank you! I look forward to using these! Perfect start to the year. This is amazing! Saves me so much time and the activities are extremely engaging. Sooo Helpful!! Thanks for this! I’m planning for next year! Very helpful and practical resource. Thanks for sharing! This is so comprehensive! I wish I could replace our reading curriculum with this! I would buy every month! Fantastic! Thank you so much! This was a time-saver when coming up with center activities. Great activities! Love this for independent centers! Very Useful in my classroom! Thank you! Really good for the younger grades…not really for 6th grade though! Love using these in centers! Great resource!!! I love these, and even better, my students love them! These have saved my Daily 5!!! Great way to organize centers! Great resource for my centers. Thank you. These are just what I was looking for. I will be back for more. What a great tool to have to begin the year. Thanks! Love this so much . . . went ahead and bought the entire year! These centers offer reinforcement of a huge variety of skills–and are so easy to implement! I can’t wait to start off the year with them this year! I feel better about centers this year. Thanks! Great resource, is this available in a school year bundle? I loved these! So easy to use! Thank you for making, these are fantastic! I’m excited to incorporate these literacy station activities in my classroom! I’m not one for “busy” work during stations-these practice important skills in an engaging way. Most importantly, I’m not having to reinvent the wheel!!! Great product! I have been laminating and prepping for the upcoming school year. I really love the fun and creative ideas. I am sure I will be back to purchase the other months. Thank you for all your time and hard work. I know my students will love these!! I just purchased the September centers to see if it was something I could use for the coming school year. I will be purchasing the entire bundle! Thank you for your time and effort in putting these together! Can’t wait to use this! Trying out September first, then hopefully purchasing the other months. Thank you. I can’t wait to use this in my classroom. Great resource for Language Arts. So well organized and laid out. Can’t wait to use it this year. Will be buying the other months as the year goes on. I needed center ideas and this is exactly what I needed. Thank you so much. I look forward to implementing them. Easy to use and differentiates! I will definitely use this when school starts. This is an awesome product! It is going to save me so much time. Thanks! What a fabulous and well organized resource! September was so good I went back and bought the whole year bundle! This is AMAZING!! It has changed my life! haha I can now face center time again! These centers are amazing!!!! I love how there are a set for each month!!!! Fantastic Resource! Can not wait to use it with my class next year!!! This was the first “Grab and Go” that I purchased. It was such a hit with my students that I have since purchased them all! Thank you! The Reading Center Packet has saved my life. It has made managing my reading centers a breeze. Beautiful graphics, well thought out. The 20 minutes for each activity is just the right amount of time. My students are on task and loving it. I love this product. I teach third graders, and I don’t quite use it the same way as you, but it is something I can easily pick and choose from to meet my needs. It’s great! Beautiful, thorough, and well-put together. Thank you!!! I ended up buying the whole month because I loved the sampler so much! Thanks!! These are FABULOUS!!!! I bought September through November and can’t wait to continue purchasing the rest of the year!!!!! Takes a little bit of time preparing everything but once that is finished you will have them to use again and again. The only thing that would make them “out of this world” is if CC standards page was included for each week. I am “over the moon” with these centers—start with the kids next week. Great ideas and well laid out. I had a hard time understanding how it works. Need to read through a few more times. These look great. I’m looking forward to using them with my class. I am looking forward to using these, as well as your future Grab and Go additions, throughout the year! Everything is done! Thank you! This is perfect to go with our school’s new flipped classroom model! Very comprehensive and well thought out, plus colorful and fun for the kids! Thank you!